The parish consists of two villages, Nunburnholme and Warter, about two miles apart. Nunburnholme lies in a valley on the edge of the Wolds. Its position away from main roads means that there is little through traffic, and the village gives an impression of rural tranquillity. The Wolds Way passes through the village. There is a population of about 150, with an age range from 1 year old to 95 years old. 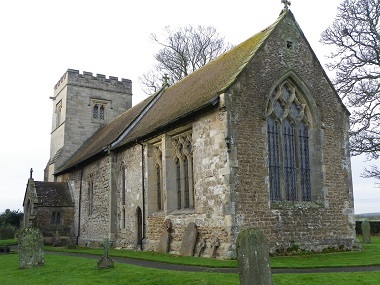 Nunburnholme was the home of Revd Francis Orpen Morris, a distinguished Victorian naturalist and author of a series of books on British birds. He was Rector of Nunburnholme from 1854 to 1893. He was succeeded in this post by his son, Revd Marmaduke Charles Frederick Morris, who in 1902 donated a new iron bellframe for six bells. He also wrote a number of books about the village and the Yorkshire way of life. Both father and son are interred in the churchyard, near the south porch. The Jubilee Committee is a group of volunteers from the village who organise events to fundraise for the church. Its main objectives are to maintain the churchyard throughout the year and provide financial support to the church when needed.